Forgetting price points and consumer trends for just a moment, what is fashion? It’s prÃªt-Ã -porter art with the pragmatist logic of form follows function. Designers have very few occasions to delve into this sort of indulgent thinking, as therapeutic as it is, much less with a circle of their peers as a supportive soundboard. Enter GenArt, an American non-profit organization dedicated to showcasing emerging visual artists, designers and filmmakers, the forum of choice for recognizing urban artistry. The GenArt/Nokia Styles 2001 International Design Competition treated the capacity crowd of 1500 at the Hammerstein Ballroom to a plethora of international design talent. While the majority of the 400 entries were American, both Canadian and overseas designers were well-represented in the competition, open to designers who have been in business seven years or less. It was a coup for Canada, grabbing top prize in two categories, menswear and sportswear. With supermodel and actress Eva Herzigova as master of ceremonies and supermodel Nikki Taylor presenting awards, the evening unraveled to see MontrÃ©al designer Kamkyl Kreativ eclipse South Korean and American labels to take the menswear prize. Allison Barr of Vancouver walked away with 1st prize in sportswear. 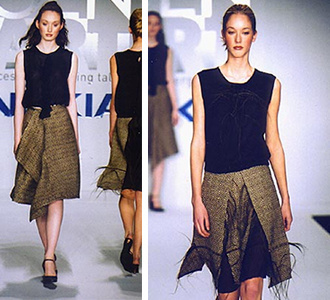 Vancouver fashion designer Allison Barr, whose mainstay is textiles and fiber sculpting, has a roots-up approach to designing. Basically creating every fabric that she works with, Barr meticulously oversees all aspects of production. Her experience in costume design for film and theatre gives this Capilano College graduate a worldly perspective. Barr is currently working on a new label, Bharr, where this perspective is no doubt being put to good use. 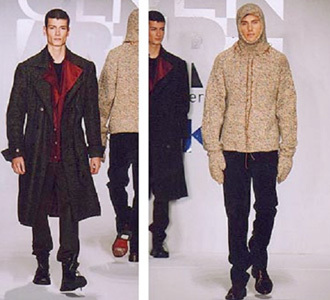 Kamkyl Kreativ, the brainchild of design team Douglas and Yvonne Mandel submitted two winning designs, a full-length felted baby alpaca military coat with red velvet lining, and a hand-knit chunky felted tweed wool sweater with hood. Fifteen years of global design experience in senior menswear positions in Germany and in the U.S. has enabled this independent Canadian label to penetrate the high-end market in only its second season, delivering all orders of the 60-piece collection months ahead of schedule. Italian luxury fabrics are made comfortable and utilitarian with precise tailoring. Kamkyl is at the forefront of bringing the Nordic avant-garde to North America. Kamkyl’s constant contact with the European market via their Milan showroom equips them to continually fuse contemporary design with the tradition of clothing as an experience. Despite the competitiveness of this event, the fostering spirit and supportive attitude towards new developments in the arts that has fueled GenArt since their first fashion stint in 1995 is alive and well, and growing stronger every year. GenArt was founded in 1993 By Ian and Stefan Gerard, along with Melissa Neumann. Run by a team of directors and a myriad of diligent volunteers, GenArt soon assembled a stellar advisory board, including William Wegman, Andres Serrano and Christo. The New York office was followed by Los Angeles and San Francisco bases as fashion and filmmaking joined the fine arts as the artistic arenas GenArt would champion.